Geneva and Rome, 25 October 2013 –The Chemical Review Committee, the scientific subsidiary body of the Rotterdam Convention, recommended this week that methamidophos (pesticide) and fenthion 640 ULV* (a severely hazardous pesticide formulation) be subject to the Convention’s Prior Informed Consent (PIC) procedure. The Committee also adopted the draft Decision Guidance Document (DGD) for trichlorfon, a pesticide recommended for inclusion in the Committee’s eighth meeting held in March 2012. The result of the ninth meeting of the Chemical Review Committee meeting is that three new Decision Guidance Documents will be forwarded to the Conference of the Parties in May 2015 for its consideration for inclusion in Annex III to the Convention and be subject to the PIC procedure. The Prior Informed Consent procedure of the Convention is a key tool for developing countries to take informed and responsible decisions on the import and on the use of chemicals that represent a danger for the environment and for the human health. It enables member governments to alert each other to potential dangers by exchanging information on banned or severely restricted chemicals and to take informed decisions on them. This provision prevents unwanted trade in the chemicals listed in Annex III of the Convention and constitutes an early warning system. The Committee reviewed notifications of final regulatory actions taken by parties for five chemicals: cyhexatin, lead arsenate, lead carbonate, methamidophos, pentachlorobenzene, and one severely hazardous pesticide formulation, fenthion 640 ULV. On four other chemicals – cyhexatin, lead arsenate, lead carbonate and pentachlorobenzene – the Committee agreed that criteria were not met and no further decisions will be taken for these chemicals at the moment. “This is the second time since the Convention entered into force in 2004 that the Committee has recommended adding a severely hazardous pesticide formulation to the Prior Informed Consent list, using the ‘fast track’ mechanism that ensures developing countries’ rights to know and trade chemicals safely are respected,” said Clayton Campanhola, Executive Secretary of the Rotterdam Convention for the Food and Agriculture Organization of the United Nations (FAO). “Putting these pesticides under the Rotterdam Convention’s PIC procedure would continue to strengthen the hands of governments and support informed decision-making about the import and use of chemicals known to harm human health and the environment,” said Kerstin Stendahl, Deputy Executive Secretary of the Basel, Rotterdam and Stockholm Conventions. The Committee’s recommendations will be sent to the Parties to the Rotterdam Convention for consideration at the seventh meeting of the Conference of the Parties, scheduled to be held from 4 to 15 May 2015 in Geneva. The tenth meeting of the Chemical Review Committee will be held in Rome, Italy, from 20 to 24 October 2014 followed immediately by the POPs Review Committee of the Stockholm Convention, scheduled for 27 to 31 October 2014. The objective of the Rotterdam Convention on the Prior Informed Consent Procedure for Certain Hazardous Chemicals and Pesticides in International Trade is to promote shared responsibility and cooperative efforts among Parties in the international trade of certain hazardous chemicals in order to protect human health and the environment from potential harm. The Convention contributes to the environmentally sound use of such chemicals, by facilitating information exchange about their characteristics, by providing for a national decision-making process on their import and export and by disseminating these decisions to Parties. Rotterdam Convention provides early warning on dangerous chemicals and prevents the unwanted international trade on certain chemicals. Stockholm Convention controls and eliminates production and use of persistent organic pollutants (POPs). Basel Convention limits “toxic trade” in hazardous wastes and ensures proper disposal of wastes. The Chemical Review Committee is the scientific subsidiary body of the Rotterdam Convention. The Committee consists of thirty-one scientific experts appointed by the Conference of the Parties to the Rotterdam Convention charged with undertaking scientific review of chemicals proposed for listing. 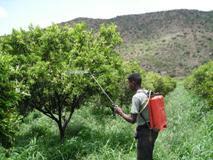 Trichlorfon is an insecticide used on a number of crops, including fruits and vegetables. The recommendation by the Chemical Review Committee to list trichlorfon in Annex III to the Rotterdam Convention was based on final regulatory actions submitted by Brazil and the European Union. Fenthion 640 ULV, among wide range use, it is also used for birds control against grain-eating birds. The proposal has been submitted by Chad, which experienced problems for human health caused by the formulation under conditions of use in its territory. The Committee decided at its ninth meeting to recommend listing it in Annex III to the Rotterdam Convention as a Severely Hazardous Pesticide Formulation (SHPF), based on the proposal of Chad. Methamidiphos is an insecticide used on many crops, it is already present in Annex III to the Convention and subject to the PIC procedure as severely hazardous pesticide formulation (soluble liquid formulations of substance that exceed 600 g active ingredient/L) and it is classified as highly hazardous (I b oral toxicity) by the World Health Organization. The Committee decided at its ninth meeting to recommend listing it in Annex III to the Rotterdam Convention as a pesticide, based on final regulatory actions submitted by Brazil and the European Union.